Prayer time on Friday afternoon for everyone to participate. 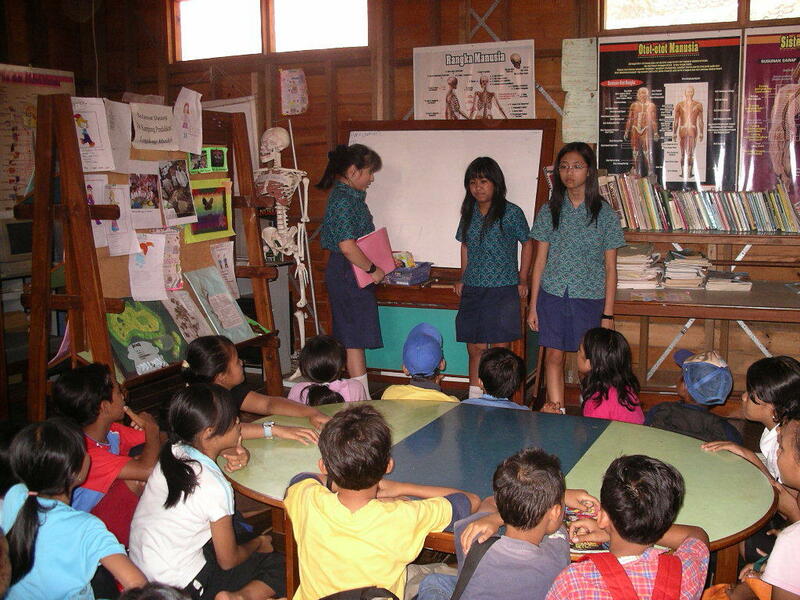 Sekolah Global Jaya students teach english at a nearby National School. 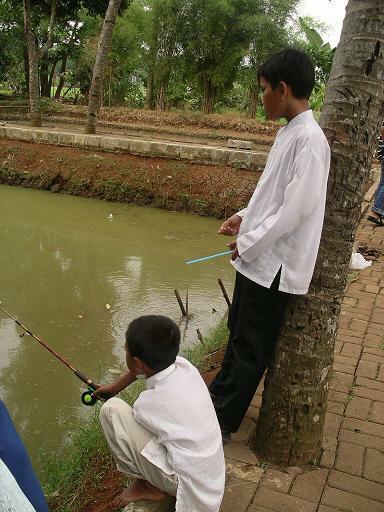 A restuarant and fish farm helps support the Paragi community. My last day at Sekolah Global Jaya. I was very touched as the Junior School students and staff gathered to say goodbye and presented me with a gift. 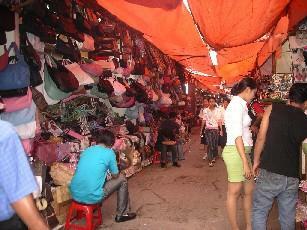 The atmosphere of SGJ is one of compassion, tolerance and open-mindedness. The staff are nurturing life-long learners in every way. I was welcomed to observe prayer time which is held at midday every Friday. All the children went to different parts of the school for their religion; Muslim, Hindu, Buddhist, Catholic and Christian. As I went up the stairs amongst chattering children many said hello and one boy asked me, 'Are you Muslim?' I joined the Muslim children and enjoyed observing their rituals. 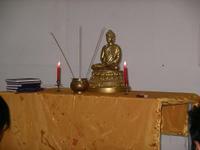 I also observed the Buddist and Hindu prayers, each group singing and celebrating their religion in different ways. This afternoon I went approx. 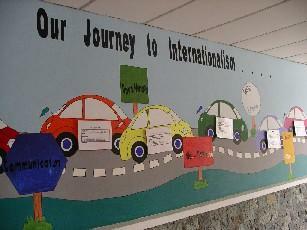 5 km from SGJ through small traditional villages and rice fields to Parigi, a national school. I enjoyed an Indonesian lunch, sitting on the floor of an open air restuarant, overlooking a rural area and fish farms. I then met the local children and was joined by years 8 and 11 students fro SGJ who teach English as part of their IB requirements of community service. SGJ is very supportive to the Parigi school. Thank you Global Jaya for making this week so memorable and informative. The children and staff were so welcoming. My host Anne Gallagher, has made my stay comfortable and entertaining. Allison Stekelenberg, the PYP coordinator, did an amazing job establishing this exchange and the blog in collaboration with Chris McNamara from St Leonard's College, fully suppoted by Kathryn Young, the expatriate primary Principal. I hope more teachers are able to experience such a postive learning experience and develop links with other schools creating international learning, friendship and tolerance. Many visitors were welcomed to the school today for an MYP community workshop for new MYP teachers from all over Indonesia. 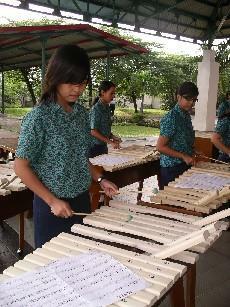 Pak Andy (the expatriate music teacher) introduced his year 9 music class who played the kolintang (Indonesian xylophone). In his introduction he stated: “The next performance is very ‘MYP’. We are using Indonesian instruments, western mallets, an Indonesian song called ‘Pesta’ (party) and a western style of music" The cultural interconnectedness between PYP and MYP was evident.There were about 1 5 students in the group who all played on their own kolintang. I also witnessed the Year 5 students filming a Balinese tale under two beautiful red umbrellas as they were finishing their Central Idea:’ Legends help us in understanding our heritage’. This afternoon, Allison (PYP coordinator and Year 4 teacher) organized a meeting with the 2 teachers w ho will be visiting St Leonards in mid-November. 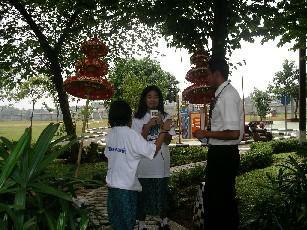 Pak Joni works with Year 6 and Ibu Juni works in the Year 2 team. 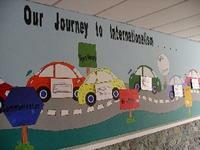 Both have never have travelled overseas and are excited about seeing another PYP school in a different context. 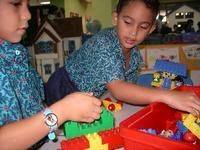 They are keen to gain new ideas concerning math and teaching practices in Australia. They also are keen to share their assessment and reporting ideas with staff at St Leonards during their visit in November. An inspiring start to the morning:one of the agama, (religious teachers) delighted children and staff alike with his traditional Balinese dance. The enchanting Balinese music played in the background as his dance retold a traditional story. The children were being exposed to aspects of the Hindu culture, despite having no Hindu children in this particular class. As the children watched, sitting quietly, I could see them getting more anxious to join in. As they were invited to have a go, there were sounds of laughter as they attempted the intricate movemen ts. The agama teacher spoke in Bahasa Indonesian and invited questions from the children. This class is beginning How we express ourselves UOI. The Indonesian teacher explained the dance to me and said it was important for the children to keep their culture and be proud of it, we have planned games, food, songs, language and looking at the map. 1. What are you your favourite books? 2.What are your favourite foods? 3.What is in your classroom? My morning began spending time with the kindergarten and reception children. Some of these children arrive before 7am and travel long distances. Some of the staff take three hours to get to work due to the traffic and distance. Each year level has a shared area, similar to our gallery, which is set up for free play. Here there are opportunities for dramatic play, drawing, painting and construction. All classes are out here together from 7.30 until 8.30, some playing outside. The very high ratio of staff means plenty of relaxed interaction with the children and time for organisational tasks such as returning readers and preparation of portfolios and self assessment tasks. The atmosphere was calm and quiet, yet busy and engaging. The kind ergarten children had swimming this morning, as they got changed I could hear them saying: "I am independent", as they put goggles and bathers on. In the reception class the teacher also used the PYP terminology: "You are a risk taker having a go at writing and I can see you are gaining confidence." In preparation for the student led conferences, I was a parent for one of the kindergarten children to practise, who showed me around the room, expressing an understanding of the unit of inquiry and other displays in the room and shared area. Each family can book in for one hour, with 4 students there at the same time. This gives them plenty of time in the different areas. I am currently in the year 4 class, they are discussing; research process six steps, lots of questions from the children and all in Bahasa Indonesia. The day started early, 7.30am. After meeting all the staff, I joined the junior school outside for their Monday morning assembly called Upacara. This is a national assembly the children ran singing traditional songs and raising of the flag, all in Indonesian. I was introduced to the students as Ibu Liz by Kathryn Young, the primary expat principal. I had a tour of the school, which is huge, and surrounded by a kampung (village) on one side and open land on the other. Plenty of space for the students in a beautifully maintained tropical garden setting. I attended two team planning meetings and was impressed by the collaboration of the one expat teacher and four Indonesian teachers. Each classroom has two Indonesian teachers who teach in Indonesian and one expat per year level to teach subjects in English.They worked together on the week aheads plan for the program of inquiry, all equally contributing ideas. A specialist (library) joined us for the year two meeting and demonstrated a truly integrated approach of specialist subjects. Time for planning meetings was available due to religion classes happening at that time. Religion seems to play a big part in the school as Muslims, Christians, Catholics, Buddists and Hindus are equally acknowledged and respected. They all go off to seperate classes and these teachers are also brought on board for units of inquiry. Just to let you all know that Liz Nixon from St Leonards College in Melbourne is visiting SGJ, Jakarta from the 11th September, 2005 for 1 week. We are really looking forward to meeting her. ps. You will have to sign up for a username and password if you want to make a comment and add to this blog.